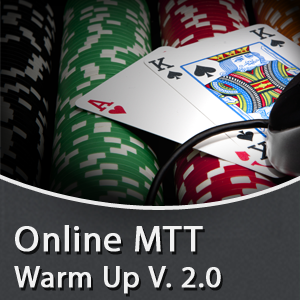 If you are not properly prepared, online Multi Table Tournaments (MTTs) can be a grind. To be the best (and make the most money) you need to be fully focused for hours on end. 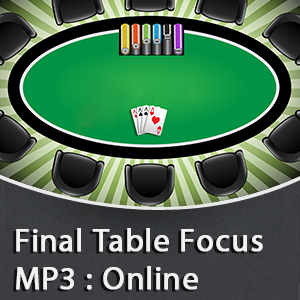 Losing focus for just one hand deep in a tournament can mean the difference between a final table score and a min cash. 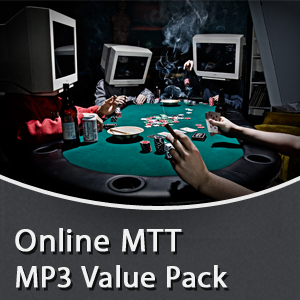 If you start your sessions by just plopping down in your computer chair, opening up the software, and registering every MTT in the lobby, you are leaving significant EV on the table. Having a consistent pre-game warm up is a proven way to improve mental performance in competitions. It allows you to get into “The Zone” at will, increasing the amount of time you play your “A-game” significantly. It can also increase your confidence in focus, allowing you to make the best decisions possible when they matter most. Taking the time to develop your own warm up can be a time intensive project, consisting of hours of trial and error. What I have done is used my expertise in hypnotherapy to develop a simple audio program that takes all the guess work out of developing a pregame warm up. With my MTT Warm Up you just need to set aside a few minutes before your session, find a comfortable place to sit, and allow the audio to mentally prepare you for the grind ahead. When you make your first final table after using this warm notice the extra confidence you have and the amount of extra mental focus remaining to help you finish the job and take home first place.